I've noted the problems in the food regs for Biddy's cheese. But it's come up now for early childhood centres which fear huge compliance costs for preparing lunches for the kiddies. $4,000 each year for permission to serve kids food at a pre-school? So the Early ChildhoodCouncil says. This is plausible and the inevitable consequence of the implementation of the Food Act 2014. But to understand how we got to this ludicrous situation you have to go back at least 35 years. The Food Act 1981 allowed local businesses to opt out of Health Act regulation by registering a Food Safety Plan (same as what is now compulsory). Virtually no-one took advantage of this provision for the simple reason that independent assessors charged $1,500+ to audit a business compared to the $100-$300 cost of registering with the local council. In the course of 35 years no-one could find any good reason for changing the way they already did business and making themselves poorer. Of course the way they did things was not "best practice". So rather than admit that that the idea of everyone being HACCP-compliant was not a cost-effective approach MPI and its predecessors got the government to pass legislation making it compulsory. And the councils are delighted because they go from a (technically) hands-off role to an active role with significant approval powers (more power, more money). I remain hopeful that councils will hold the cost to small businesses of administering the new regime at the same level as they do now. To that end MPI have published an excellent template that food service businesses (cafes, restaurants, pre-schools) can use to set up their system. From what I have seen these types of businesses should be able to set up their system in a few hours. But that largely depends on the whim of their council. Any dispute under the Health Act had to be fought out in the District Court. Now the power shifts completely to the council. And what we have also seen in the cases cited by the Early Childhood Council is that, if the council chooses not to be in the approval/auditing business, then small local businesses are thrown to the commercial auditing companies at whatever price they choose to quote. I respect Mike Joy's work looking at river quality. But man he makes a hash of things when he strays from what he knows about. His oped in today's Dom Post ... it's hard to know even where to start. It is an embarrassment to the institution that employs him. The piece's central thesis is simply wrong. He claims that orthodox economics ignores externalities. Anyone who has taken a principles-level course has encountered externalities. It is in every principles-level textbook I have ever seen. It's sometimes covered badly, but to the extent it's covered badly, it's to leave the students with the impression that any external cost justifies government action rather than focusing down on policy relevant externalities (Pareto-relevant technological externalities that affect choices at the margin rather than having inframarginal effect). Policy can and often does screw things up. Mike goes on at length about the negative externality imposed by intensive dairying and how that's the fault of orthodox economics. The orthodox economics of intensive dairying discounts these externalities because they are met by the public, economically and environmentally, not by farmers. That's not the fault of orthodox economics. Bog-standard orthodox economics says to use something like the nutrient management regime in place for the Taupo catchment to address negative externalities. It doesn't say "dump all the crap in the river because somebody else's problem." That's like the classic kind of case that a Principles or Intermediate lecturer might use to illustrate an externality problem and then have the students think about potential solutions. This is David Suzuki level illiteracy. Did Mike learn his econ from David Suzuki? Is there nobody at Massey whose principles lectures he might consider attending? There are some decent economists at Massey. Maybe he should go ask one for a Principles text. "Sustainable economic growth", a principal objective of orthodox economics, is an oxymoron according to a real science conjecture that growth within any closed system – including population and economic growth within Earth's closed biosphere – is ultimately unsustainable. The Limits to Growth report published in 1972 by the Club of Rome tested this conjecture through computer simulations of a future Earth under various assumptions. Its "business-as-usual" simulation predicts catastrophic "overshoot and collapse" of the global economy, natural environment, and human population from about 2020 onwards. Disconcertingly this projection has accurately tracked 40 years of subsequent statistical data. Accordingly it must be heeded as real science. That's interesting. I have a copy of the Second Edition of the Limits to Growth (1974). Here are some of the real science predictions they made. This is totally real science that hasn't at all been disproved. Running out of non-renewable resources, with scary graphs about Chromium. You know about the big Chromium shortage right? Noticed how the cars don't have chrome bumpers anymore? Totally evidence. While rising GDP per capita would reduce family size in developing countries, the proportion of families wanting four or more kids is totally increasing in income in richer places. You've seen a lot of families around with four or more kids in rich places, and especially among richer people, right? Population greater than 1970 levels is unsustainable. All that's wrong. Population growth is levelling off and the problem in rich countries is potentially declining population absent migration. Poor countries are growing faster than rich countries, with dramatically slowed growth in rich places. Chromium prices in 2014 were higher than in 1974 in real terms (but lower than the price in 1975! ), but has anybody heard of some looming shortage? No. There's also no shortage of food and no looming shortage of food. The main places where there's scarcity of food are places that have explicitly rejected 'neoliberalism': Venezuela and North Korea. Family size in rich countries is declining. There's plenty of chrome for anybody who wants chrome. Simon won his bet. The main thing that the Club of Rome really got right is carbon dioxide emissions and global warming - although they missed the declining carbon intensity of production. But carbon emissions aren't a problem of neoclassical economics either. That's a problem of not putting in a global carbon tax or a global emissions trading regime. There are tons of orthodox economists that lefties would call 'neoliberal' who are in Club Pigou. It would be a fun exercise to go through the membership list of Pigou Club and see how many times each member has been called a neoliberal. I don't think the number would be small, especially for Mankiw, but I can't be bothered to check. Anyway, if you think there's something called neoliberal, well carbon taxes are totally neoliberal. The divide between the rich and the poor, despite "trickle down", is growing faster in New Zealand than in any other developed country. Is growing. That's the present progressive tense. Something that grew and continues to grow. Ok. What about this then? Just look at that growing growth! It's totally growing. Scary growing. Like the Chromium shortage and Mike Joy's credibility. Do university academics' duties as critic and conscience of society require them to talk nonsense about stuff well outside of their fields of expertise? Massey might consider asking Joy to get an economics degree if he intends on continuing to purport expertise in the topic. The bout round the bach? The fight in the Ferns? I chatted this afternoon with Jim Mora's Panel at Radio NZ about the potential government funding of a coming boxing match. There's apparently been Cabinet-level discussion of whether the government should throw money at the boxing match to make sure it happens in New Zealand rather than someplace else. A boxing match is a commercial endeavour. If investors thought it would be more profitable here than it would be hosted elsewhere, they’d be putting in private money in anticipation of that return. That this benefit, relative to the government’s outlay, is bigger than the government can get from spending the money elsewhere, or from leaving it in taxpayers’ pockets in the first place. Governments love subsidising big sporting events. They talk a lot about the extra spending that tourists coming to events bring with them, but the kinds of studies backing these things up are usually pretty flawed. First, they’ll count spending by visitors rather than profits on spending by visitors. Where there are costs involved in providing services to visitors, those need to be brought into the analysis. Second, they’ll assume that the visits would not have happened but for the event, and that the visits that do happen do not displace other visits. Both of these are often wrong. People who had always planned on visiting New Zealand and who like the event might shift the timing of a visit to coincide with the event. And other people who could only visit New Zealand during the time of the event might be put off: hotels get booked out for big events, for example, and rental caravans can be hard to find during things like the Lions’ tour. Just looking at the spike of visits during a big international event isn’t enough. You also have to account for displacement. Finally, none of this much enters into the picture for a boxing match which would draw fewer tourists in than a big sporting tour anyway. Minister Joyce noted that he’d hope that the government might be paid back if the match turned a profit. If I were operating under that kind of contract, I’d be pretty sure to pay myself and staff bonuses big enough to make sure there weren’t profits, or to buy my supplies from a related company at inflated prices to make sure there weren’t profits to pay back. But maybe the companies with whom the government strikes these kinds of deals are more publicly spirited. Government funding of boxing matches... I'm just reminded too much of Mobutu Sese Seko fronting the costs to host the Foreman-Ali fight: the Rumble in the Jungle. RNZ's panellists weren't having a bar of it either. Neill Miller has great economic intuitions - he also pointed to most of the stuff that I covered. And I doubt I'd disagree with Gordon Harcourt's take that the main point isn't the economic benefits of having tv cameras reporting from an indoor arena in Auckland instead of wherever else, but rather the potential drawing of voting support from South Auckland fans of Joseph Parker. I followed on immediately after Marewa Glower's excellent discussion of vaping as a way of avoiding the weight gains that otherwise may come with quitting smoking. Update: Catch also Sam Richardson on point here. I also heard him on Radio NZ on the way in to work this morning. Christchurch's game of SimCity continues. Has it been 6 years already? Part of the Grand Plan for downtown had the Crown buying up blocks of land running along the south side of the old downtown. The area along the north side of Moorhouse Avenue had a pile of car dealerships, among other businesses. The Master Planners thought it would be nicer as a park with walking access, and with potential to be turned into apartment buildings or townhouses someday down the track. The wishes of the owners of that land were rather secondary to the Master Planners' visions. You can do funny things when you're a Master Planner. Like designating a strip through the middle of someone's business as the necessary walking path, deciding the rest of the property is no less usable because of the taken strip, and trying to pay compensation for the taking just for the strip down the middle. SimCity is a fun game - for the planners at least. Private negotiations between the Crown and central city businesses appear to be holding up plans to acquire the last plots of land sought for Christchurch's south frame anchor project. The Crown says it has just 4000 square metres of land left to acquire, after spending the last four years spending $25 million buying up 25,000sqm for the shrinking anchor project. The project, containing laneways and public spaces, was designed to frame the core of the city, along with the east frame and north frames and Avon River precinct. Otakaro Limited has confirmed designations covering much of the south frame land remained relaxed, with south frame designation fully, or partially, lifted on 54 per cent of properties initially in the plan. But Colliers International's Christchurch managing director, Hamish Doig, did not understand why the Crown was continuing to pursue land for the project, labelling the south frame a "folly". An Otakaro spokesman said talks with a "range of landowners" were ongoing, but refused to comment further or provide further details because of the "commercial nature" of the discussions. "The south frame will be delivered in stages as land is acquired for the laneways and public spaces. "In many cases only a portion of a parcel of land will be required for the south frame public realm," he said. Doig said he was not surprised negotiations had taken four years, but he was surprised the Crown was continuing to acquire land for the south frame. "What surprises me [is] that they're continuing to pursue it. "I think the whole idea of laneways through the southern frame and through the Health Precinct is an absolutely flawed concept," Doig said. The project would have some merit if there was "connectivity" between the blocks earmarked for development. "So you've got this swathe of lanes through the middle of the blocks . . . Colombo St, Durham St, Montreal St and you have to walk up to the lights to to actually go across at a controlled intersection. "One thing I do know is that basically we humans are lazy, we're going to take the course of least resistance, so why wouldn't we walk down the footpath rather than walk through a lane? "It just seems an absolutely flawed way to commute . . . I just don't understand it," Doig said. It isn't that hard to understand. Somebody in government thought that downtown Christchurch was too spread out before the earthquakes, that car dealerships never belonged downtown in the first place, and that restricting the space available for a downtown would force it to be denser. Designating the frames would take land out of circulation and prop up prices downtown, which by the magic of underpants gnomes would encourage people to rebuild downtown. And the parkland frame could later be put to residential use to encourage more people to live downtown. Lovely. But nothing quite worked out as planned. And so the parks became laneways and nobody could quite admit that a dumb sunk cost should be abandoned. Maybe abandoning it would encourage those property owners put out by the designations and the consequent legal costs to seek compensation for the very real harms done them; maybe it's just too hard to admit you're wrong. It's so stupid, now that CERA and CCDU have dissolved all the weblinks on their projects are dead. Way to erase the rebuild history. It's all still held in some back archive, but if you thought you'd saved useful links for later research, well, if you didn't cache the page in Evernote, you're probably out of luck. In Seinfeld, when George realised that every instinct he'd ever had was wrong and that he just needed to do the opposite, he needed to remember what his usual pattern was. Doing the opposite doesn't work if you can't remember what normal is. Come Wellington's eventual earthquake, just doing the opposite of CERA and CCDU wouldn't be far from wrong - but that requires remembering what the government did to Christchurch. Breaking the links doesn't help with that. During the earthquake recovery, my Canterbury colleague John Fountain wanted to build a secondary flat into his house to help meet the demand for housing. John's since moved to Nelson. Nelson also isn't keen on secondary flats. John's on the case. Here's his piece at the Nelson Mail. Tourism in the Nelson-Tasman area is booming, but residential households are excluded from sharing in the gains by a prohibitive regional tax. The same tax also inhibits the development of affordable rental housing in decent residential areas in our region. The tax in question masquerades as a "development contribution" on second kitchens : $25,000 in Tasman and $10,000 or more in Nelson. A second kitchen in one residential dwelling is "deemed to be" an actual second dwelling in each region's District Plan, and therefore subject to a full, second development contribution. Homeowners can and do choose to have as many bedrooms, bathrooms, toilets, living rooms, study spaces, recreation rooms, garages and workshop spaces, as they want and can afford. But try to have a second kitchen and you'll have to pay an extortionary tax, if you meet all other requirements for a second dwelling on your property. Since a renovated/new second kitchen might cost anywhere between $10,000 to $25,000 homeowners effectively pay a sales tax well over 100 per cent of actual costs. Naturally, few homes with second kitchens are ever built (at least legally). * The only sense I've been able to make of it is that the Grand Pooh-Bah of Christchurch planning at the time couldn't be bothered to change the rules that pre-dated the earthquakes - and especially not if some of the relatively undamaged houses around the University might turn into student flats and annoy rich privileged old homeowners near the university who loved to walk their silly little dogs around campus but would be happier to see the university burn for want of student housing than to ever have a student live anywhere near themselves. I've loved Leonard Read's I, Pencil. It's a classic. Reed slowly explains how nobody in the world knows how to make a pencil. Knowing how to make a pencil means knowing how to get the wood, which means knowing how to make the axes and transport vehicles, which means knowing how to mine and smelt iron, which means knowing how to make the machines to do all that, and how to feed and clothe and house all of the people involved at every step in the process. It's a beautiful exposition of what the market coordinates voluntarily, automatically, without anybody much thinking about it. There's an excellent kids' book version of it now out. My kids have enjoyed; yours might too. But for the grownups, consider I, Whisky. Matt Ridley doesn't call a Vogon a Vogon, but that's what he's talking about at The Times. The UK has a process-based nightmare in planning. New Zealand is in the same boat, but Peter Dunne will not allow the government to fix the Resource Management Act to solve it. Ridley points to a new iron triangle. Lobbyist charities do well in fundraising and point to blocking things as evidence of success. Politicians take astroturfed complaints from the lobbyist campaigns as evidence of popular opposition and so insulate themselves through lengthy processes - which also suit the bureaus. And lawyers intermediate, with complicated processes both providing avenues for suits and for regulatory consulting work. AUT's Rhema Vaithianathan sees the potential for big data in the public service. Fortunately, when it comes to monitoring and informing, Big Data can really deliver. So once our data is up to the task, these jobs won't need to be done the old-fashioned way by armies of civil servants. It is thoroughly feasible for NGOs to ask the government to run evaluations on their own effectiveness. They can provide the government with the details on the people they're serving and what outcomes they're targeting. The government can then set a control group of people matched to the NGO's clients in IDI, or to do one better and help the NGO randomise treatment and control where the NGO can't afford to help everyone they'd like to help. Then any outcome measure they want can be tracked and evaluated: future interactions with CYF, prison recidivism, workforce attachment, child doctor visits, child immunisations - anything on which there's administrative data. And, even better, the NGO can then tell the government what their cost of outcome delivery has been. Once that's in place, interesting things happen. Rhema notes the massive potential disemployment in the Wellington bureaucracies. One of the big advantages Ministries have over their Ministers is information. They're the ones who know things, and who can tell the Ministers things when Ministers want to know things - or refrain from providing useful information. There's a whole public choice literature on bureaucracy, agencies' information advantage over Ministers, and equilibria when Ministers can implement costly legislative control devices to help them better monitor agencies' true costs and output. Big Data, done right, can help route around it all that. And if that can be combined with real information on the real costs of not just delivering services but of providing the outcomes that the Minister wants - that's a game changer. In our report on Social Impact Bonds, we looked forward to a world in which any NGO or community group could pitch an outcomes project to Treasury, Treasury would tell them the current going price for improving that outcome, and the NGO would then seek investor funding to deliver the service. Whether you see the resulting data on real outcomes and real costs of providing outcomes as a bug or a feature may depend on whether you're part of a monolithic Ministry with a big information monopoly that's under threat. A few times a week, Hanson has lunch with a group of George Mason economists. One brisk Thursday, Tyler Cowen, John Nye, Bryan Caplan, Alex Tabarrok, and Hanson drive over to China Star, a Sichuan-style Chinese restaurant near the campus. The atmosphere is collegial; they talk about bets they’re making with one another, what they’ve already won and lost (also painstakingly detailed online, as several of them are prominent bloggers), and tease Hanson for his grandiose visions of immortality. Cowen, author of An Economist Gets Lunch (Dutton, 2012), orders for the table, and over spicy dishes passed around they dig in. "Robin is so fond of generalizations that he’ll often ignore varying details," Nye says. "It leads to good ideas, but it also leads to, in my view, crazy ones." "That comes from physics," replies Hanson. "There’s a reductionism that comes from physics," Cowen says. "Reductionism, monism, trying to recreate the problems of theology, moralizing, ‘meta,’ and hating hypocrisy — that’s Robin in 10 words. He’s a modern gnostic." Later, after digressions into The Lord of the Rings, futarchy, and the relative innovativeness of the iPhone, Hanson wonders aloud why his ideas aren’t more widely circulated or accepted in academe. His colleagues don’t hesitate to offer theories. "Robin’s work would be much more accepted if he just did one weird thing and everything else was normal," says Caplan. "If everything was normal but he did the future, that’d be OK. But he has seven or more weird things." "I’m rolling more dice, so there’s more of a chance one of them will come out right," Hanson says. "But," replies Nye, "there’s also more of a chance it’s crazy." In today's Dominion Post we learn that Wellington area police have an ongoing investigation against a euthanasia group. They've arrested an elderly woman who'd imported drugs that could be useful in euthanasia, and confiscated another elderly woman's helium balloon kit. It is understood a second elderly woman was also involved in the October 7 raid, part of what police are calling Operation Painter, and that one of the women spent the night in a police cell. I wonder if they took any lessons from Arlo Guthrie's Officer Obie in making sure that the cell was safe. Meanwhile, some of the War on Meth has become self-financing courtesy of New Zealand's asset forfeiture legislation. A $15 million boost for anti-drug initiatives is not an admission that the Government is losing the war on P, Prime Minister John Key says. However, Key acknowledges methamphetamine has become "the drug of choice" for some Kiwis, while police must do more to stop P coming into the country through remote areas like Northland. The Government has announced the funding for 15 anti-drug initiatives, coming from money and assets seized from criminals, as part of its Tackling Methamphetamine Action Plan. The war may be lost, though. Earlier this month, Radio NZ had the Police Association telling us that meth is now purer and cheaper than ever before. Remember that half-billion dollars' worth of meth seized on 90 Mile Beach? No apparent effect on the price of meth. There is so much meth out there that the biggest seizure ever in New Zealand has had zero effect on prices. And I still need to stock up on working pseudoephedrine-based cold medicines whenever I go back home to Canada - all in the futile fight against meth. The police actions on meth will be futile, but help build a pool of seized assets. I don't know what the police think they're achieving in raids on elderly people who want to be able to end their lives painlessly should need to. Brendon Harre spells out the case for formalising neighbours' Coasean bargains. He argues we should all be able to build up to three stories by right, with provisions against encroaching on neighbours' sun, but with better ways of mutually waiving those provisions. Neighbours can always agree to not object to each others' encroachments into recession planes. But you then can have a sequencing issue. If I agree today to allow you to go up to three stories and block my backyard sun because you're agreeing to let me build up in the back yard anyway, that's great. But if you then sell the house, your agreement doesn't move with the property. And so I might be reluctant to agree in the first place - unless I can get things lined up to build quickly as well. I think this idea came originally from Stephen Franks. I touched on it in my piece at The Spinoff; it's great to see Brendon laying out more of the details. When Freud saw a picture of a cigar, he wasn't so sure it was a cigar. When some folks see a picture of cricket bats, well, we get this. 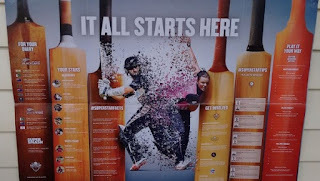 Horiana Henderson thinks this poster - from NZ Cricket, with no alcohol industry branding on it, is somehow marketing alcohol to kids. I was disturbed by the poster intended for my eight year old because the message I received was that our national sports team and his sporting heroes, the Black Caps, were associated with alcohol. The wood-grain of the bats, the elegantly wrapped handles, the striking composition, the colours as well as the lighting all gave off an impressive and sophisticated look. The reasonable placement for such a poster would have been on his bedroom wall where he would pass it each night before he went to sleep and each morning when he woke up. No battery, electricity or charger required. Are the Black Caps a vehicle to circumvent the Law Commission's regulations regarding alcohol marketing to children? So anything that is elegant, striking, impressive and sophisticated must be part of some big alcohol conspiracy. Alcohol can often be elegant, striking, impressive and sophisticated, but not all elegant, striking, impressive and sophisticated things are alcohol-funded. Last week, I presented at the Hospitality Association's annual conference in Auckland. I noted there that some folks, like Alcohol Healthwatch, seem determined to turn any stat into evidence of a crisis - even if the stat shows a big reduction in problems. I suppose this is another for that file. We are truly living in the age of moral outrage becoming a lifestyle choice for some. Should badminton rackets have been used? (old-fashioned bottles of cognac)? Hockey sticks? Abstemious tennis rackets? No. Given this is about cricket, then probably cricket bats are probably are the most appropriate. New Zealand Cricket has confirmed that the items in the poster were in fact cricket bats. They said that, in the end, and following due diligence, they felt that cricket bats were a good fit for what, after all, was a cricket promotion. Calling sporting organisations for wrongdoing is a worthy pastime, but it really does help when there is based on a bit of reality. I don't favour lifestyle regulation or lifestyle taxes. But I'll make an exception for the moral outrage lifestyle. That one does have substantial negative externalities that should be mitigated. The 2009 regs on raw-milk cheeses came in under National. National's 2008 election campaign was all about doing away with the Helengrad Nanny State. If readers can think of any policy area in which National has proved less nanny-state than Helen Clark's Labour government, please let me know in comments. I cannot think of any currently. There are some areas where they have held the line against increasing paternalistic regulation, but it is much harder to think of areas where they reversed things. Fully legalising gay marriage could count, but it isn't like Helen Clark wouldn't have done that had she won in 2008. Massey University's Professor Giselle Byrnes, Assistant Vice-Chancellor (Research, Academic and Enterprise), writes on the public benefits of tertiary education in this past week's NBR. She makes a good case for the existence of public benefits; the main thrust of the piece is that the Productivity Commission's report on tertiary pays insufficient heed to the public benefits while focusing on the private benefits and the appropriate share of those borne by students. Leaving aside for now that the Prod Comm report was rather broader reaching than that, the casual reader of Professor Byrnes's would likely be surprised to find out that the government is already covering about 82% of the cost of tertiary education, once you factor in the subsidy provided through the zero percent loans scheme. Mightn't it make sense to point out the private benefits if making the case for bringing the private and public cost shares into closer alignment with private and public benefits?